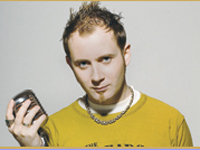 Simon Collins (born September 14, 1976 in Hammersmith, London) is a Canadian musician. - Parents: Phil Collins (English musician and member of Genesis) and Andrea Bertorelli. Phil Collins met Andrea in a drama class in London during 1975. Simon is their only child together; however, Phil also adopted Bertorelli’s daughter Joely Collins who is now a Canadian actress. Phil And Andrea divorced in 1980. Simon Collins is multi-talented like his father. He sings,plays drums and piano. Since the age of fourteen he has been composing and producing his own material on the path of his own solo career. In 2000, Simon moved from his home in Vancouver, Canada to Germany, where his debut album All of Who You Are was released. The album sold 100,000 copies in Germany alone. The first single “Pride” was charted all over eastern and western Europe. The second single “Shine Through” co-written with Howard Jones, also became an instant radio hit. In 2005 Simon released his second follow up album “Time for Truth” revealing an even greater artistic depth and independence as a producer and multi instrumentalist. Simon Collins creates intelligent, progressive and emotional music that explores new sonic territories combining his love for both rock and electronic music. He creates thought provoking music that people can escape into and also feel a part of on an intellectual level. Simon follows in his father’s foot steps inspiring a new generation of listeners as well as giving people something fresh and new. Simon gravitates towards themes of space, mystery, emotional journeys and he searches for the common spiritual and celestial ground we all share with each other. Simon weaves this message through profound lyrics, vast soundscapes and lush ambient textures, driven by a fusion of both electronic and organic beats. All of this interweaves with heavy influences of Euro-trance, techno and retro rock. Simon’s unique blend of influences range from Genesis to Peter Gabriel, Pink Floyd to Massive Attack, Depeche Mode to Coldplay, Radiohead and Psychedelic Electronica. It’s been said that Simon’s vocals sound like a cross between Phil Collins, Peter Gabriel and something all his own. As a musician he’s definitely in the same family in more ways than one and is naturally appealing to fans of his father’s work. But with Simon’s unique perspective and energy in a new world of music, he aims to reach out to a wide audience of listeners and thinkers. Paying homage to Genesis with his latest cover of ’82 Abacab’s “Keep it Dark”, Simon Collins embraces his heritage and carries the torch. Having recently signed to top US indie label, Razor & Tie, Simon is currently in production on his third album of original music which will cover new ground artistically. Marking a significant plateau for his career as a musician, songwriter, producer and performer.